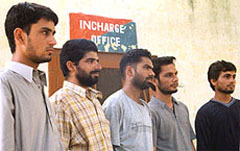 Five Punjab youths, arrested at Atari railway station, while talking with media persons at Atari police station on Saturday. Intelligence agencies are interrogating the five Punjabi youths who reached here yesterday by Samjhauta Express without passports. They are still in the custody of the government railway police. With the state Assembly elections round the corner, MLAs and ministers of the ruling parties have started wooing voters by issuing cheques to them under the garb of various grants allegedly by violating norms of the Urban Development Scheme and Projects. The Director-General of Police Punjab, Mr Sarbjit Singh, said today that the cops facing cases of human rights abuse should not insist on returning the bravery awards received. The Punjab State Medical and Dental Teachers Association has demanded that a doctor be appointed as the Director of Medical Education and Research. Stating this during a meeting held here today, Dr B.S. Sohal, general secretary of the association, said, “only a professional can understand the intricacies and problems of the department and find remedies for these. Is SGPC a missionary body? PTU slams doors on SC students? Has Punjab Technical University slammed its doors on Scheduled Caste students? It seems to be the case, going by the plight of several aspirants who have allegedly been denied reservation benefits by the PTU authorities under one pretext or the other during the counselling last week. Their pleas to the Chancellor of the university and Punjab Governor, Lieut-Gen J.F.R. Jacob (retd), have failed to yield any result. The District Health Authorities foiled an attempt by a member of paramedical staff and another person to administer distilled water injections in place of hepatitis B vaccine to residents of Chauke village at an immunisation camp held yesterday. A racket pertaining to the bringing of girls and boys from Bihar and Jharkhand to Punjab on the pretext of employment but instead selling them sexually exploiting them came to light yesterday following revelations by two women. Punjab Chief Minister Parkash Singh Badal today set rolling the ball for Assembly elections of the state when he asked his party workers to get ready for the elections. Mr Badal was in the city for ‘sangat darshan’ programme to be held tomorrow at a village in the district. Mr P.K. Verma, Principal Secretary, Health and Family Welfare, Punjab, yesterday inspected the local civil hospital and took a serious note of the insanitary conditions in the surgical ward of the hospital. Mr Verma was on a visit to the hospital as part of routine inspection of health centres and hospitals of the district. Even as the summer palace of Maharaja Ranjit Singh undergoes a facelift to mark the 200th coronation year of the Maharaja, the former summer palace turned into museum since 1977 provides no vehicular access to the historical building as both the roads leading to the palace have been barricaded by the municipal corporation here. If one belongs to the ruling party in Punjab, he can easily evade prosecution even if the vigilance inquiry indicts him. This seems to be true in the case of the Ropar Municipal Council where the Vigilance Bureau officials conducted a raid in May. The Punjab Tourism Minister, Mr Swarna Ram, today told a press conference that the much-awaited overbridge on the local Satnampura railway crossing had been cleared by the Union Government and the Railway Ministry and would be constructed at a cost of Rs 16 crore. A “Lok Adalat” was held here at the Patel National Memorial College today. Justice H.S. Bedi, Punjab and Haryana High Court presided over the adalat. At least 2,500 cases were taken by 26 Benches. Justice Bedi said till now 1925 lok adalats had been organised in which approximately 1.09 lakh cases had been solved. Mr Sukhdev Singh Dhindsa, Union Minister for Chemicals and Fertilisers and Secretary-General of the SAD, today called upon Punjabis to crush forces which wanted to create disturbance in the state by exploiting the sentiments of people. Three persons died and one injured when a Maruti car (PB02-7586) in which they were travelling collided with a truck parked on the road near Babri, 3 km from here, yesterday. The truck had been impounded following its collision with a car yesterday. An executive engineer and a clerk had died in the mishap. Even as the residents of the city are yet to forget the Bollywood style incident in which a youth had shown himself as murdered to elope with his paramour, another incident surfaced recently in which a person purchased weapons illegally to eliminate a former paramour of his beloved. However, he was arrested before he could carry out his plan. The district police has solved a case involving a domestic help who used to post letters allegedly threatening her employer. It is learnt that she borrowed the idea from a TV serial “Khoj”. Police sources said the maid, Lakshmi; who hails from Bagloo (Nepal), was employed with Mr Charanjit Singh, a local resident. She allegedly used to post threatening letters to her employer. In a major breakthrough, the police today claimed to have arrested a group of six international thieves and succeeded in recovering stolen goods worth Rs 85 lakh from their possession. This group used to prepare bogus documents and defrauded banks, Faridkot police chief Gurpreet Singh Gill said. The police has booked four travel agents — Ashok Kumar, Mukesh Kumar of Kurukshetra and Shashi and Inder Kumar Goel of Sangrur under Sections 420, 406, 506 and 34-B, IPC, and Immigration Act, 1983, for defrauding Davinder Kumar of Rawalpindi village of about Rs 4 lakh with a promise to send him to New Zealand. A glaring error made by the Punjab School Education Board is costing Bansi Lal, a class VIII student, and his mother dear. Bansi Lal 12, said the board declared him fail on the basis that he did not appear in Hindi and Punjabi examinations. He claimed that he appeared in all examinations. Mrs Manjit Kaur Ghuman, Principal, Government Senior Secondary School for Girls, Gurdaspur, has been placed under suspension and Mrs Amarjit Samra, Deputy District Education office (Secondary), has been posted in her place. The Vice-Chancellor of Punjabi University, Dr Jasbir Singh Ahluwalia, is openly opposing the candidates of the Teachers United Front and is campaigning in favour of the United Teachers Federation candidates, a faction of the PUTA, led by its president Dr Bhupinder Singh Khaira, has alleged. The local court has restrained the protesting lecturers of the women college here from holding demonstrations, dharnas on the college premises and within a radius of 500 metres and also from interfering and creating obstructions in the entry and exit of college personnel, visitors and students to the college. The Mizoram Governor, Mr Amolak Ratan Kohli, inaugurated Satguru Rural Education Institute Management and Technology College at Chotti Baradari here today. Mr Kohli said the nation was known in the world primarily because of its achievements in nuclear, space technology and computer fields.